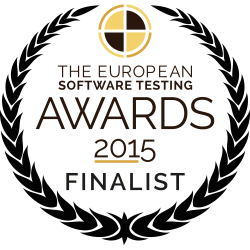 London, United Kingdom October 8, 2015 – iTrinegy, the leading provider of networked application risk management solutions, is proud to announce that NE-ONE Flex, its virtual appliance network emulator has been shortlisted in The European Software Testing Awards (TESTA) under the prestigious SAGE Most Innovative Project category. The NE-ONE Flex Virtual Appliance Network Emulator offers the perfect solution for organizations operating in a virtual environment, as it enables developers and testers to validate that applications built and tested in virtual environments will work as expected, in the real world, whether physical or virtual. Being a virtual solution itself, NE-ONE Flex can be spun up and flexibly shared anywhere within the organization in order to test application performance. It does not require the installation or configuration of any physical appliances. The SAGE Most Innovative Project category recognises projects that significantly advance the methods and practices of software testing. NE-ONE Flex, being the world’s first “industrial-strength” network emulator for the virtual world fulfils one of the category’s main selection criteria, namely pushing boundaries within the testing industry. “The value of iTrinegy’s hardware-based network emulators, with their ability to create safe controllable facsimiles of real world networks for testing applications has been recognised for a long time now. But now, with so much application development and testing being performed in fully virtualized environments, there is a high level of demand for a product which can accurately replicate real world networks in the virtual environment. Our NE-ONE Flex is that product. Now developers and testers get the capability to test in real world networks without leaving the virtual world” said iTrinegy Product Director, Frank Puranik. The European Software Testing Awards celebrates every year the companies and individuals who have accomplished significant achievements in the software testing and quality assurance market. The whole industry was invited to enter 20 categories including the Best Test Automation Project; Leading Vendor; Testing Innovator of the Year; and Best Overall Project. The winners will be announced at the Gala Dinner in London on 18 November, 2015.